Lactobacillus Reuteri Probiotics | Multiple Benefits | Get Here! 2.5 billion micro-organisms per capsule. The human gastrointestinal tract contains about 100 trillion bacteria which form a vital interface between the genome and the environment. Potentially weighing up to 2 kilos, these bacteria are collectively known as microbiota and research increasingly shows they play a more significant role in overall health than we could have imagined. Among the thousand or so recorded species of probiotic bacteria - living micro-organisms that have evolved in the human body - are lactic bacteria of which bifidobacteria, lactococcus, streptococcus and lactobacillus are sub-categories. Of the many identified species of lactobacillus bacteria, Lactobacillus reuteri offers significant support for cardiovascular health. Indeed, researchers are now discovering just how important probiotics are for human health as a whole, their benefits extending well beyond those associated with the digestive and immune systems. Animal research and now clinical studies have demonstrated that ‘condition-specific’ probiotic supplements are fast-acting and effective for certain metabolic diseases and are also free from side effects. Various animal studies have highlighted that this probiotic strain can reduce total cholesterol by 38% and triglycerides by 40%, without affecting levels of HDL-cholesterol. Even with a high-fat, high-cholesterol, low-fibre diet, taking L. reuteri can prevent a rise in levels of these substances. In mice fed a Western diet, those supplemented with L. reuteri gained significantly less weight and accumulated less total and hepatic fat than those in a placebo group. • while at the same time, maintaining levels of HDL-cholesterol and vitamin D, vital for the cardiovascular system. These convincing results were achieved after just 6-9 weeks’ treatment, in complete safety and without the side effects associated with statins. Another study has also highlighted the ability of Lactobacillus reuteri to increase by more than 26% serum levels of 25-hydroxy-vitamin D. It was the first clinical study to establish a link between oral supplementation with a probiotic and an increase in circulating vitamin D - a vitamin essential for the cardiovascular system, bone health and cell protection. L. reuteri produces an enzyme called BSH (bile salt hydrolase). This reduces intestinal absorption of dietary cholesterol which is then excreted in stools. Like all fats, cholesterol requires conjugated bile acids in order to be absorbed. Taking L. reuteri increases excretion of cholesterol in stools by breaking the chemical bonds of conjugated bile acids. A second mechanism, and the subject of new research, could also play a part in reducing both cholesterol and the risk of cardiovascular disease. As well as being reservoirs for excess cholesterol, bile acids are also powerful signalling molecules that regulate cholesterol metabolism via the action of farnesoid X receptor (FXR). When conjugated bile acids break apart - in the presence of L. reuteri - that signalling is modulated, accelerating the breakdown and subsequent excretion of cholesterol and in addition, limiting the reabsorption of cholesterol from the intestine. With its overall effect on cardiovascular health, L. reuteri is proving to be an ideal complement to other heart health supplements such as phytosterols, fish oils, soya or soluble fibre. Moreover, in terms of activity, 100mg of Lactobacillus reuteri (1 capsule) will suffice whereas you would need to supplement daily with 2g of phytosterols, 4g of fish oils, at least 10g of fibre or 50g of soya to obtain the same efficacy. 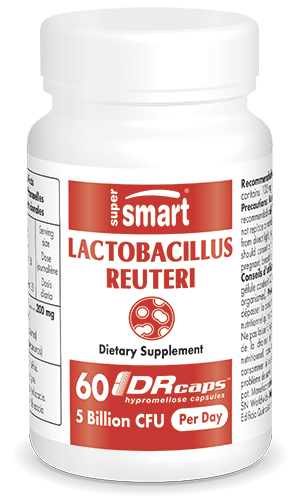 Lactobacillus reuteri thus marks the start of a new era of probiotics, with effects that extend beyond the intestinal tract, helping to eradicate important physiological disorders in a totally safe, natural and inexpensive way. Each capsule provides 2.5 billion microorganisms encapsulated using new technology, DR Caps™ - delayed-release capsules. Intake of Lactobacillus reuteri is therefore optimal because it is absorbed in the small intestine where it passes directly into the bloodstream, without coming into contact with destructive stomach acids. DR Caps™ are certified 100% vegetarian and contain no synthetic coatings. Each capsule contains 100mg of Lactobacillus reuteri (2.5 billion microorganisms). Adults. Take 2 capsules a day. Each capsule contains 100 mg Lactobacillus reuteri (2.5 billion microorganisms).